The raspberries are ripe right now. I’ll be picking them this afternoon. The blackberries will follow shortly, and of course the strawberries daily. It is a good time to be a consumer of food. 🙂 Happy Monday, my friend! 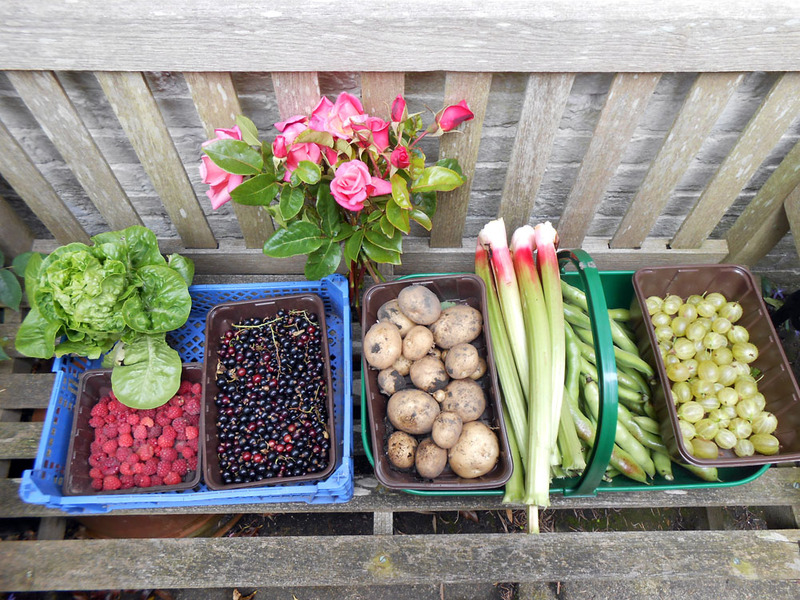 Fantastic harvest Sarah, I hope you enjoy the fruits of your labours! I’m thrilled that in my back yard in a couple of containers I have actual broccoli! Yes, Andrea, I am enjoying the fruits of my labours 🙂 I haven’t tried growing broccoli. Must have a go with it, perhaps in containers in my back yard, rather than down at the allotment, so I can keep a watch for caterpillars and various other voracious predators. So far, Mister hasn’t submitted to my suggestion of growing sprouts, due to the prospect of fighting of pests, big-time! It’s all delicious produce, but a labour of love went into the harvesting and into the cooking. I ‘m going to have a go cooking blackcurrant jam and hopefully I won’t burn it, as I did with the gooseberry jam last week! Booking my table and may I say I am well impressed by your industry. Mister did all the heavy digging and planting. I’m called in later to help with weeding and harvesting … then, of course, I have all the cleaning, preparing and cooking to do. You are welcome to my table, although the travelling expenses down south would be rather prohibitive! Oh yum! What a fabulous harvest! It’s been crappy weather here, too, apart from one week in “flaming” June! But the sun has deemed to show its happy face today, so I’m hoping it will stick around for more than a week this time. My petunias have looked very wind-swept and bedraggled after last week’s assault. Thus, Dale, maybe those who wait later to plant their gardens until later are the wise ones! I am very pleased with it indeed. It tastes so much better than shop-brought produce, because it’s fresher. I particularly love tomatoes, fresh from the garden, they always taste like sunshine to me. yum. I have two friends who live there. They would both attest to the goodness of local tomatoes. Thanks, Sylvia 🙂 There are some beautiful rosebushes growing alongside the fruit and vegetables in our allotment. For weeks I’ve been able to have a vase of fresh roses on my kitchen table. There’s more produce this week — twice as much almost! Redcurrant jelly and blackcurrant pie are next on the agenda I think, just to name a few delights.